The above info came from Mandy, and was edited by yours truly (contact me). The image came from CTRL-A. Fifty years ago a force of darkness battled against the Raves, which a woman named Resha Valentine created using Ethelion. 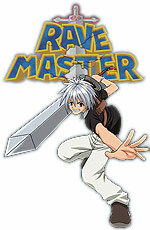 Siva, the Rave master, battled the Dark Bring (the force of darkness) which created an explosion called the Overdrive. Now we join a 16 year old boy named Haru Glory and his weird mutant dog animal creature named Plue. One day, Haru was fishing and he pulled Plue out of the water. 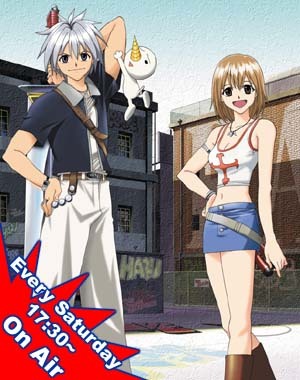 Plue becomes his guide as he goes on a journey to become a Rave Master! Haru fights his first enemy and his sword, Ten Powers, gets broken. So he and Plue travels from Garage Island to Hip Hop Town and Punk Street in search of Galein Musica, the legendary blacksmith. Plue gets kidnapped by Georco, a thug from a gang called Demon Card in Hip Hop Town. Plue is then entered in a dog race. Elie, a girl they meet who has no memories, helps Haru rescue him without knowing it. Then she takes the two to Punk Street where they meet Musica. So we have a boy named Haru Glory, a girl named Elie who lost her memory and resembles Resha, and Hamrio Musica, a thief and leader of his gang of thieves. Along with their other friends, they all embark on an adventure with many interesting characters. Note: The series ends at episode 51 even though the story is left hanging. This is simply because Studio Deen never finished it. Another series with this dubious status is Pilot Candidate. The above description came from Mandy and Kalene, and was edited by yours truly (contact me).